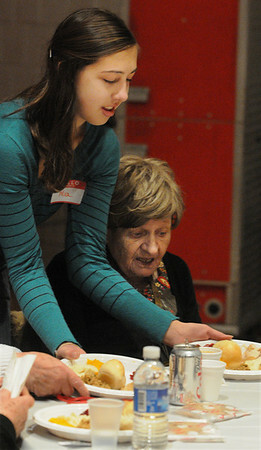 Mia Accomando, left, Salem High School freshman and member of the orchestra, serves a turkey dinner to Bettyjean Tilton during the Senior Citizen luncheon at Salem High. Over a hundred senior citizens were served turkey dinners and were entertained on Thursday. Photo by Ken Yuszkus/Salem News, Thursday, November 18, 2010.